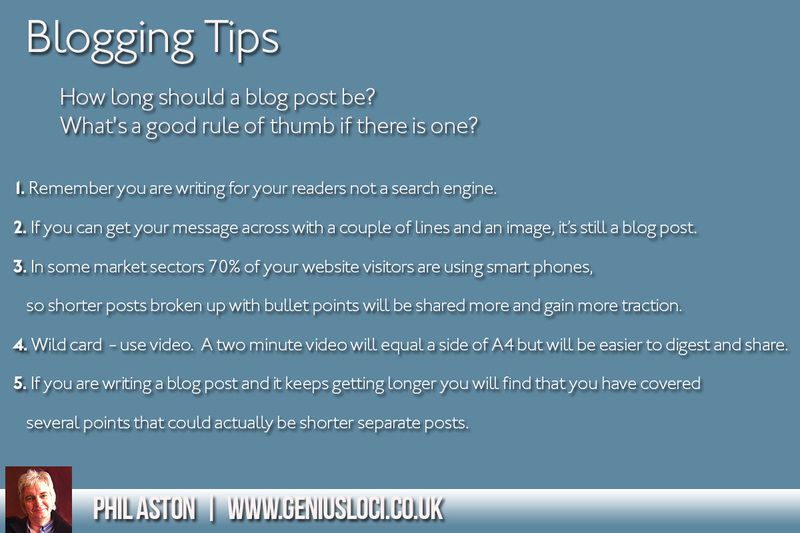 Blogging Tips – How long should a blog post be? The thing to remember is you do not have to do something that is the pinnacle of creativity. The amount of websites that I see that haven’t updated or published a blog post for 3 or 4 months is around the 80% mark. Are the images ok or too big? Do I have to allow comments? You do not have to produce something which is the height of creativity. Just document what you are doing. The thing to remember with your blog is that the rest of your website is more corporate. For example, the ‘about’ page, product or services pages are about your brand message. However your blog is a more personal part of the website, it is where you can more yourself. So, your blog post could just be a few lines or a couple of photos, basically just documenting what you are doing in that moment. You might be taking bookings, preparing orders, meeting a client … that’s a blog post! Your blog is a chance for you to bring a bit of social media behaviour into your website and then from here you can share your blog post to your social media channels. This makes a lot of sense as your goal is to get people to visit your website. Clients send me a few lines via email, some photos and I pull the post together using the right keywords for SEO and ensure it fits in with the overall design and look of the website. I then help boost it on social media and share it across our network. The key thing is to write and post something and be consistent, so if you are going to blog every week, do it every week. This does take time but it will pay back in dividends for your business and building trust online. If you want any help, support or advice with blogging or your website please get in touch. What’s a good rule of thumb if there is one? Remember you are writing for your readers not a search engine. If you can get your message across with a couple of lines and an image, it’s still a blog post. In some market sectors 70% of your website visitors are using smart phones, so shorter posts broken up with bullet points will be shared more and gain more traction. Wild card – use video. A two minute video will equal a side of A4 but will be easier to digest and share. If you are writing a blog post and it keeps getting longer you will find that you have covered several points that could actually be shorter separate posts.